Japan Farmers Markets: Tokyo Farmers Market October Outing: Reminder! Takako Kimura and her awesome veg! It probably won't be this cold, though, when we go. Just in case you forgot to mark it in your calendar, I'm here to remind you about another little outing I'm doing this month. We're off to the Nippori Farmers Market, which despite being new on the scene is one of my favorites in the city.Give a shout and join us for a few hours of fun exploring seasonal foods in one of Tokyo's loveliest spots. If it's clear, perhaps we'll even get to see Mount Fuji! This month I'm inviting people to join me on a visit to the Nippori Farmers Market. This delightful market is tucked away in one of Tokyo's most historic areas and is, in my opinion, one of the hidden gems of marketdom in the city. A two-day monthly affair, the market offers a very nice selection of foodly items to eat there as well as take home. 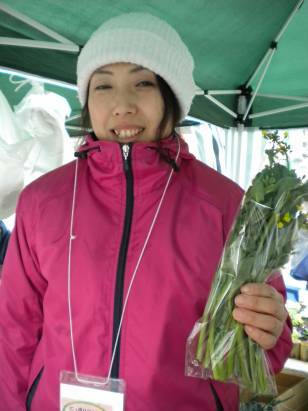 Atsuko Fujita, the market manager, carefully curates the vendors to make sure shoppers have excellent choices as well as ensuring various regions are well-represented. Growers from Aizu Wakamatsu and other parts of Tohoku have been on hand for each of my previous visits giving visitors a chance to support the region's recovery in one of the best possible ways: economically. Throw in some music and dancing, and it's easy to see why this new market is steadily growing. Meet at the bottom of the stairs of Nippori Station's East exit and we'll walk over to the market. Meet the market manager, the vendors, have a little snack (I recommend the manju. ), and do a bit of shopping. We'll head off afterwards to historic Yanaka (same station, just up the hill) for a walk-about, perhaps some lunch, a visit to the Fuji Viewing Street, and general exploring. I may stay longer than the finish time, and folks will be welcome to join me if I do. I love this part of Tokyo! Hey Joan! Will there be a November Issue? I'd really love to join you on a trip to the Nippori Market but October is already too chockful for me to schedule another event. This sounds like a perfectly lovely way to spend a Saturday and I hope to join you on one of these jaunts soon! There may be. I'm debating it as I've got a couple talks coming up about farmers markets, one of which will include an outing. I'll keep you posted!